How To Build A Dollhouse – If You’re Looking For a DIY Project Then Why Not Make Your Own! Miniatures and dollhouses were among the most popular children’s toys in long times past. Now, collectors and hobbyists have taken to this wonderful pastime as well. Adults and those who are young at heart purchase wooden dollhouses to furnish and display according to their preferences. And who can blame them? Dollhouses are one of the best ways to express your inner interior decorator on a much smaller scale. Parents get in on the action as well. They spend countless hours and build intricate houses with minute furniture that’s too small for kids to play with. Building your first dollhouse can prove to be an immensely pleasurable experience. Believe it or not, you don’t have to put too much difficult work to complete one. 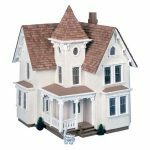 There are hundreds of dollhouse kits to build from which you can choose from that are easy to put together. 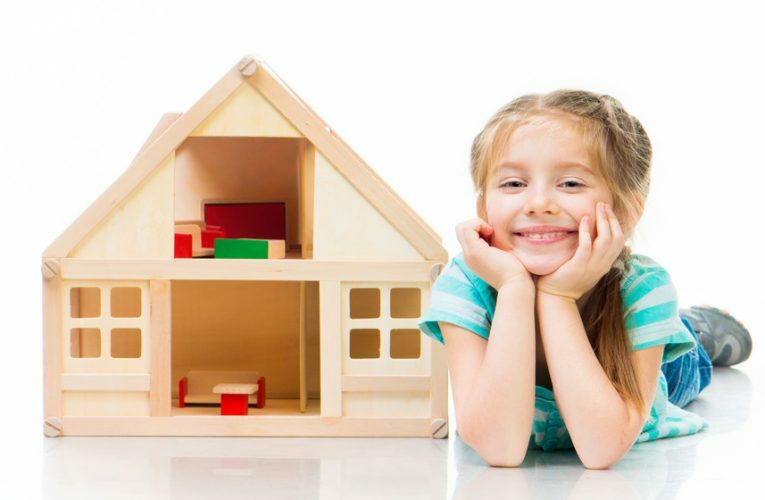 Assembled dollhouses can be a precious family heirloom that will last for hundreds of years. Kits, by themselves make building dollhouses easy. It provides a step-by-step learning curve. Towards the end, you’ll know how to build a dollhouse from scratch. Dollhouse building will be a breeze as time goes by, but like most hobbies, you’ll need sufficient time and patience. The key to consistency is to keep on going and allow yourself small breaks when you become too tired. It’s not about speed, but patience! The wise saying that Rome was not built in one day can be applied here. Any project will be definitely worth it in the end. Pay attention to detail and plan carefully. Your next completed dollhouse may be lying in wait right under the holiday tree. As mentioned, you’ll need to prepare for when building a miniature dollhouse. Don’t be overwhelmed with all the pieces when you open the box. Simply organize them and it will seem less intimidating and more empowering. You will need a dedicated work-space for building your dollhouse with. This area should be clean, have ample lighting for dollhouses, and large enough to fit in all the dollhouse materials comfortably. Open the dollhouse box and go over the manual. Start labeling the pieces using sticky notes for the organization process. Dollhouse kits usually have everything you need to fully assemble them, but it doesn’t hurt to keep some useful tools and supplies handy to make the project easier along the way. It would be best to have the miniature parts painted so you’ll be ready to put them in anytime. Last but certainly not the least, think of how you can add some of your personal touch to each dollhouse project you undertake. Gathering The Parts. You will need essential miniature dollhouse supplies such as magnifiers, electrical supplies, hand tools, adhesives, etc. Adhesives are particularly important for hobbyists, especially for wooden dollhouse enthusiasts. These can come in many variety- wallpaper gel, tacky wax or a mini mortar mix for the miniature bricks! You’ll need a table saw, or if you can afford it, a bench-top compact model that has a small-diameter blade. Get an experienced person to accurately cut out the strips if you don’t have the appropriated cutting tools. 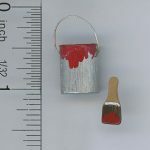 Glue – You will need glue to secure most of the miniature dollhouse parts. The best kind of glue is wood glue- it sets quickly but you can still wipe or sand it pretty easily. Paint sticks with it, and the applicator tip is a plus. We recommend Elmer’s Carpenter Wood Glue. Masking Tape – You can set this to keep your pieces from falling off as the wood glue dries. You can also use it for covering certain areas you don’t want painted yet. Pencil – Use it for lining up the parts and marking the lines for cutting. Hammer – There are some dollhouse kits that have some nails included. These nails hold down the structure of the dollhouse securely. Fine Tooth Saw – All quality dollhouses have fittings that are ready for assembly, but just to be sure, bring in a fine tooth saw should you need further cutting or trimming. X-acto Knife – Great for shingling roof. Can also be utilized for cutting and trimming parts. 100 Grit Sandpaper – Smooth down cut edges with an appropriate grit sandpaper. Rubber Bands – Also may be used for holding the parts together as the wood glue dries. Rubber band is mainly used for assembling window frames. Turntable – Not a must-have, but it makes the experience so much better. You’ll have an easier time working with your dollhouse project. You’ll also get to have a chance to admire your finished product on nearly every angle. Utilize latex enamel paint, semi-gloss for the accent color and the main exterior. You will need quality paint brushes to go with the best paint for dollhouses. Use a 320 grit sandpaper to sand in-between paint coats, removing uneven surfaces and irregular blobs. Miniature dollhouses come with rectangle-shaped shingles. If you think a different-shaped materials such as diamond, fish scale or square shingles, or different materials such as tile, aluminium, tin or slate shingles make your dollhouse shine, then go right ahead. Wooden shingles are best dyed in either grey or red-brown. Wear protective rubber goals so as not to stain your hands while dyeing the shingles. Lay each shingle on a large cardboard to dry them out. You can use a type of glue called Liquid Nails to attach the dollhouse shingles to the roof. Dollhouse wallpaper is perhaps the best way to decorate your interior walls. Purchase pre-pasted sheets if you can, as it will make the work easier in the long run. When it comes to flooring, there’s a variety of options- rugs, carpet, marble flooring patterns, wood and tile. Now for one of the most exciting parts of building a small doll house- the accessories and furniture! The size and your budget should be kept in mind. For a truly customized dollhouse, you can even put in lighting for dollhouses or create your own miniature items! Keep it simple – Remember what we said about imagination? This applies to assembling, designing and building your dollhouse. You can cut significant time and take alternative building choices, such as cutting a window out of a catalogue instead of manually cutting one right into the miniature house. It’s ok to not be perfect – The fun in building a handmade dollhouse is not worrying about putting in each piece perfectly. Dollhouse building is great because you can involve your young ones with it. You may even be surprised at the level of creativity they can come up with! Be creative – Need a miniature toilet? How about a shampoo lid and a floss container? Or a lampshade made out of empty scotch tape spool? A miniature kitchen sink can be had from a case of Altoids. A bookshelf can be made into a multi-level dollhouse loft. You can make it larger for a big doll house to allow more space for your dolls to grow. 3-story Barbie doll house plans can be just what Barbies need to be comfortable in. Customize your dollhouse – make it user-friendly for the whole-family. Girls are not the only ones who love to play dollhouse games and role-play different life scenarios. 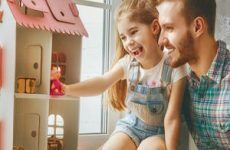 Making your dollhouse gender-neutral means the boys can also join in the fun while encouraging active and educational play. Keep it open – An open dollhouse will invite kids and hobbyists alike to play with your miniature dollhouse from either side. Wood usage – Plywood and MDF are the best wood available for construction of a dollhouse. They can easily be measured and altered according to your specifications. MDF is thicker than plywood, so you need to plan ahead for the difference in wood thickness. Are your dollhouse furnishings pre-made or will you make your doors and windows from scratch? It can prove to be very tricky, especially if it’s your first time. Beginners can make do with ready-made dollhouse furniture kits and leave customized furniture for later. Step 1 – Take a 1/2″, 4 x 4 sheet of plywood. Line the center and cut it in half. You should now have 2 wood pieces that measure exactly 2 x 4 each. Step 2 – Line up and cut 1 sheet to a 2 x 2 size. Label it as the back and store it for later. Step 3 – Find the peak by measuring the center on your 2 x 2 and marking it. Set the square in the center and mark both sides to 40 degrees. Steps 4 – Cut the peaks, then sand the edges. Step 5 – Build up your box by placing the other 2 x 4 plywood sheet and cutting it into 4 6 x 24-inch strips. Then, cut 2 of them into 6 x 13 and 1/8 inches. Step 6 – Screw your box with the short sides on the inside, and the longer ones on the top and bottom. Step 7 – Do some 6 3/8-inch measuring on the bottom of the box, marking it on the back and front. This is where the shelf will sit. Do the same for the other side. Step 8 – Cut one more piece of wood to 6 x 23 inches, screwing them in where you marked it. The end result is a box with your back piece and shelf finished. Step 9 – Utilize the 2 x 4 wood piece and cut out 2 8 x 24-inch strips. Mark the ones at the 19-inch mark, then tilt your saw at a 45-degree angle for the peaks to meet. Screw in the peaks to the top of your back piece. Step 10 – Stain or paint both dollhouse pieces. Allow it to dry. Screw in the back piece, then decorate accordingly. Dollhouse complete – well done! We hope you have found this article helpful in deciding whether embarking on a D.I.Y. project is for you, and if so, whether a dollhouse kit or making one from scratch is more appealing. For information and reviews on top selling assembled dollhouses click here.